Interactive Map Location of Gaea Town in Torren. A town which used to house the Gym that the The First Augur managed. Gaea Town is only accessible to the player after obtaining Rock Climb. Because of its reclusiveness, the town was previously used as a stronghold by the First Augur when he was battling with the cults. 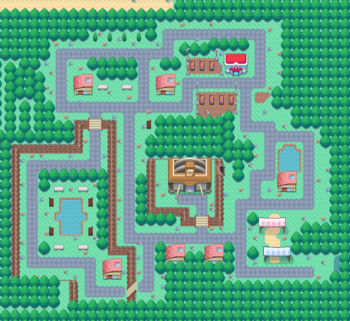 Head northwest from the entrance to Route 17 to enter the area under Adam's old Gym. Explore the basement of the old Gym for a bit before finding a spot where the player can use Hyperspace Hole to make a portal appear. Enter the portal to arrive in No Man's Land. After visiting the Ancient Tower and reading the notes that can be found on the ground of every floor of the tower, the player should speak with a scientist who can be found on one of the benches near the southwestern pond. After fulfilling these conditions, he becomes excited and invites the player to participate in a bit of a research project that he has been involved with for some time. Follow him to Metchi Town to continue this quest. A balding man sitting on the bench to the southwest of the Pokémon Center will give the player a Red Paperclip when they speak to him. This begins a sequence of item trades, which continues in Midna Garden. No Man's Land is an extremely desolate, icy area of unknown origin that provides access to the Alpha Temple. Its exact location is not known nor is it known what region it belongs to. A portal leading to No Man's Land can be found in the basement of Adam's old Gym. The player can find the Dream Guru in the house farthest to the northwest. The player may use the Dream Guru to change the ability of one of their Pokémon into their Dream World ability. This service will cost the player a Dream Mist in exchange. A man claiming to be the smartest person alive is located on a bench in between the houses to the west of the Pokémon Center. He offers to calculate anything for the player. Perhaps the player should try to perform a calculation that is impossible even for someone with his abilities? If the player tries to divide by 0, the game will crash. Upon restarting the game, a mess of "glitched" textures can be found to the southeast of Torren when soaring. When entered, the player can be transported to "NO DATA", where MISSINGNO can be found and caught. Talk to the blond haired NPC in Southwestern most House with Shellos/Gastrodon in the player's party. Near the entrance to Route 17 is a Mart Worker who is offering to sell all of the Plates except for the Pixie Plate to the player. An red haired guy in the east of town offers to teaches the move Dig to the player's Pokémon. A blue haired lady in the west of town offers to teaches the move Headbutt to the player's Pokémon. An old woman sitting on a bench in the west of town is willing to teach several moves to the player's Eevee that it would normally only learn after evolving. The one downside to these moves is that the player's Eevee cannot evolve while some of them exist on its move set. However, Eevee requires some of these moves in order for its Mega Evolution to reach its highest potential. A Juggler wandering around near the PikaTaxi guy is willing to trade the player a Darumaka for any Water-type Pokémon. Interacting with any of the TVs in the town's houses has a chance of spawning a Rotom. The player receives Celebi from Nora as a gift before she leaves to travel to other regions after the player has completed the Elite Four rematches.